It’s no joke when you keep turning the corner to find a basset hound staring at you. 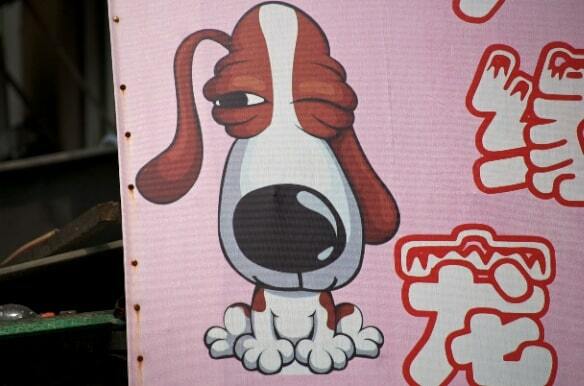 I’m pretty sure that this was Mason working as a secret service basset in Shanghai. Watching over our every move. To see whether we were buying sufficient treats to take home for him. He’s going to be sorely disappointed! Having set off to the other side of the world I was unsure how I would manage to keep up my blogging. I need not have worried too much really. With my trust IT support person with me it’s been easy to resolve any unforeseen issues. Right now I am blogging using my laptop connected to my mobile phone via bluetooth and although the speeds are much slower than usual I’m still able to carry on blogging. How clever is that? The mysteries of technology never cease to amaze me. I was even slightly amazed that our luggage was reunited to us without too much of a hitch. That’s not always been the case in my experience and I’ve actually lost my complete luggage forever on one occasion. Again the powers of technology have helped. Shame that the stuck cargo doors on the plane weren’t so technologically reliable! It’s been a pleasure to be able to share with my blog readers my adventures on the road. Thanks so much to you all for taking the time to drop by and leave me comments as well. You’ll have seen from his tweeting (or micro blogging as he likes to call it) that MT is getting the blogging bug. You may be relieved to know that reports on Shanghai are complete. The only thing I didn’t really record on my daily travels is where and when we slept and eat. Sometimes there is rather too much detail in blogging so I saved you from that. I did want to say that although we planned our eating adventures we were badly let down by restaurants that had either shut or had changed hands. We did however have some fantastic meals in Shanghai and enjoyed local cuisine including the most sublime crab and local speciality drunken chicken. We also ate the most wonderful Thai food which was a particular adventure for me as I’ve never been that much of a Thai food lover but decided to give it a go again after watching Rick Stein on his recent Asian food adventures. Now I wish I’d stuck with it for longer. Now that the Shanghai adventure is over I’ve got heaps to blog about from the UK perspective. At the end of a busy day blogging is a great way to relive the experience and reflect on what you’ve gained. Once again that blogging bug has bitten. Looking forward to telling more tales but right now I need some jet lag relief. Do come back soon and tell me what you think.